A Fool Such As Columbia! 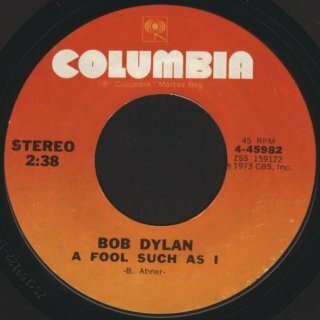 This page discusses the writer credits for A Fool Such As I from the 1973 Columbia album Dylan and international 7" CBS singles. To return to 1973 or 1974, click the links or click the "Back" button on your browser. Thanks to Jerry Kendall for his invaluable help with this page. I've used red for the title of the song Bob sings and italics for the song he doesn't. The Swanee River Boys in the 1940s: Buford Abner (who didn't write A Fool Such As I) is lower right There is still confusion at Columbia over who wrote A Fool Such As I! The current bobdylan.com entry credits this song to "B. Abner" as did the original Dylan US LP, some Columbia singles and the 1990s CDs (see 1973). However, my UK LP copy (also see 1973) credits the song to "Trader" and several CBS worldwide singles credit it to "B. Trader" (see 1974). The song sung by Bob on the 1973 Dylan album was actually written by Bill Trader, and is credited to him everywhere else (for example on the hit versions by Hank Snow and Elvis Presley, including current CD releases). The active ASCAP copyright (360042268) for A Fool Such As I, sometimes listed as (Now And Then There's) A Fool Such As I, is in the name of "William Marvin Trader". Bill Trader was primarily a song writer, and A Fool Such As I was originally a hit for Hank Snow in 1952. 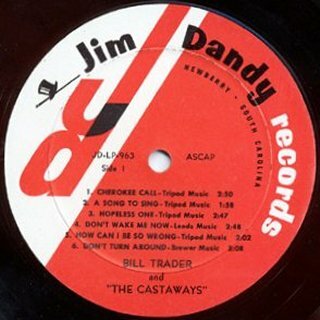 However, there is at least one album by Bill himself, Bill Trader Sings His Songs illustrated here, from 1962 and backed by a group called the Castaways. Bill also co-wrote a song called I Found Love Again with Hoagy Carmichael. Another song of Bill's recorded by other artists was Don't Wake Me Now, included on the album shown. But who is "B. Abner"? When a copyright is given for that name, it is "LeFevre Sing Pub Co (BMI)" (see below, the LeFevres were a southern gospel singing group). The BMI web-site identifies him as (James) Buford Abner, born in Lineville, Alabama in 1917 and the lead singer of the Swanee River Boys, a popular Southern singing group who have been performing since the 1930s, and who sang mainly gospel material. Buford Abner wrote and copyrighted many songs (he has 116 BMI copyrights) including a gospel song called A Fool Such As I, but the country standard A Fool Such As I is a completely different song, as confirmed by Jerry Kendall, who has albums containing both songs. The Swanee A Fool Such As I is credited to LeFevre (BMI), the Trader A Fool Such As I is credited to MCA Music (ASCAP). The "B. Abner/Le Fevre" pairing comes from the gospel song, and was misapplied by someone in Columbia in the USA to the song that Bob sings. Other Columbia/CBS companies probably carried out separate copyright searches in their own countries and got it right. 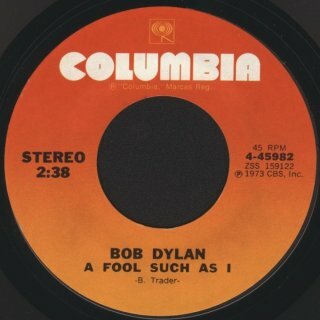 Since the mistake was eventually corrected by Columbia USA on 7" singles, it seems incredible that it was carried over on to the soon-to-be-deleted 1990s CD versions and still persists on bobdylan.com! The photo of the Swanee River Boys shown here was taken in Chicago, IL, 1946-48, and comes from a web-site dedicated to vocal harmony groups of that period. The album illustrated, Swanee River Boys' Finest, which contains the Buford Abner song A Fool Such As I, dates from around 1965. I happened upon your website while doing a search on Buford Abner and think I can clarify some of the questions re: "A Fool Such As I". I met Buford last Saturday at the "Grand Ole Gospel Reunion" in Greenville, South Carolina. He is 85 years old and still as sharp as can be and still sings well and picks a guitar well. He told me of the Swanee River Boys being a summer replacement on radio for The Three Suns (pop instrumental group) in New York many years ago and they continued there for some two years, I believe. He told me of their having such guests on their shows as Bing Crosby, Bob Hope, Roy Rogers and Dale Evans, and Dean Martin and Jerry Lewis. Buford is a great guy and very interesting but he, as you relate, had nothing to do with the popular version of "A Fool Such As I". 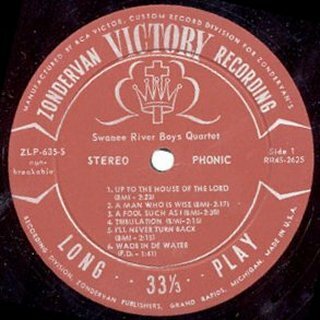 The Swanee River Boys did a totally different gospel song of the same title, however, on the Swanee River Boys Finest LP on Zondervan ZLP-635 back in the sixties. Neither the record nor the cover specifically indicate that Buford wrote the song but this seems almost certain as the cover says he wrote four of the songs on the LP and it was licensed by BMI; two songs were written by Bill Carver, another member of the group, while four were Public Domain and I have knowledge of the authors of two or the other songs so this one was written by either Buford or Bill Carver. It would seem that the two songs were probably on whatever list Columbia looked at and probably in alphabetical order and they listed the first one in giving Buford improper credit. I believe, but am not positive, the singer to the upper right in the picture to be Billy Carrier and Buford to be the one to the lower right. I can give you a bit of input on Bill Trader. 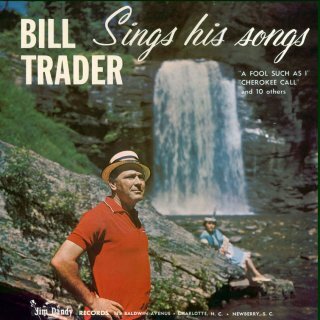 I have an album by him entitled Bill Trader Sings His Songs on the obscure Jim Dandy Records Label of Charlotte, North Carolina, and Newberry, South Carolina - the cover shows both Charlotte and Newberry but the record shows only Newberry. A postal code on the cover leads me to believe this LP was done in the mid sixties or earlier and I now see that a license plate on a car in a photo of the backup group has a 1962 date, although the picture may have not been taken at the time of the LP. The author of the liner notes relates having met Bill when he came to WBT (Radio) in Charlotte some ten years earlier and the picture of Bill on the front sleeve is said in a note attached to the cover by the guy I bought the record from a few years ago to be at Looking Glass Falls in Brevard, North Carolina, so it seems he likely was a North Carolina boy, either by birth or by moving to the state. All the songs on the LP are said to have been written by Bill with "A Fool Such As I" and "Don't Wake Me Now" being included with both being published by Leeds Music. All twelve songs on the LP are licensed by ASCAP with nine of the additional songs being credited to Tripod Music and the other to Brewer Music. I believe the Bill Trader LP will be self explanatory but some additional info may be needed or of interest for the Swanee River Boys cover. 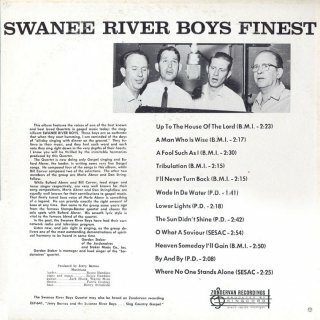 The Swanee River Boys in the picture on the front sleeve of that LP are (Front to Back) Buford Abner, Bill Carver, Don Stringfellow, and Merle Abner. Merle was Buford's brother and he is now deceased. I don't know if the other two are still living or not. On the rear sleeve, the members are (left to right) Buford Abner, Bill Carver, Don Stringfellow, and Merle Abner. I believe Buford as Lead Singer and Merle as Bass Singer were members of the group from start to finish while the Tenor and Baritone positions changed on several occasions through the years. 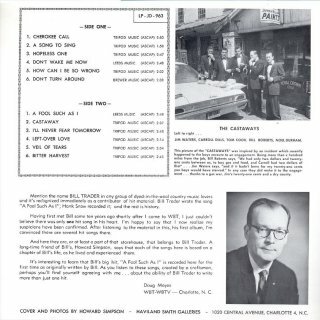 As for my arriving at the likelihood that Buford wrote the gospel version of "A Fool Such As I", the listing of the songs on the back of the Swanee River Boys LP include "O What A Saviour", which was written by Marvin Dalton, and "Where No One Stands Alone", which was written by Mosie Lister, while four others were listed as Public Domain. This leaves the other six songs (all BMI) to have been written by Buford (four) and Bill Carver (two) as I related to you earlier. Mosie, by the way, is possibly the all time greatest gospel song writer and he, at age 81 or 82, was also at the Grand Ole Gospel Reunion in Greenville last week. 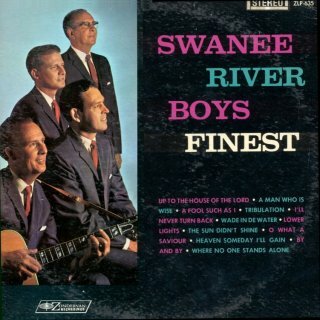 In fact, Buford and Mosie, along with two other veteran singers, sang together in re-creating the Swanee River Boys sound at one of the concerts. Mosie is still writing hit songs and it is interesting to read on occasion speculation as to when the expression of rock and roll first appeared on record. Mosie wrote a variation of this phrase about 1950 in the song "Happy Rhythm" which was a big hit at that time by the Statesmen Quartet and has been recorded by many gospel groups since that time. Some of the words are "There's a happy rhythm, it's a rocking and a rolling, I can feel it moving when I sing this song, want to feel the feeling moving on and never stopping, deep within my heart it keeps a rolling and a rocking, rolling and a rocking and a rocking and a rolling, it's a happy rhythm in my soul". Jerry has sadly informed me that Buford died in Nov 2011 at the age of 94. An article from his local newspaper which mentions the Columbia mistake can be found here . Mosie Lister celebrated his 90th birthday on 8 Sep 2011! Jerry's son Alan runs the Grande Ole Gospel Reunion site, which can be found here: . "I just stumbled on your website and read with great interest. I met Bill Trader in 1964 not knowing he wrote the song that Elvis recorded. Enjoyable man to talk with. Bill died just a few months ago in Florence, SC, where he lived. As I understand he was raised in Darlington about 10 miles from here. He was well known and respected in this area." "I read your account of Bill Trader writing A Fool Such As I and thought I would add what I know of the history of that song. I have been taking music lessons from a man named Bud Orr of Charlotte, North Carolina for the last few months and he has a very interesting story regarding Bill Trader. Bud is in his late 70's (78 I think) and told me recently that the song A Fool Such As I was written on his front porch. I decided I would research it on the internet and found your website. Bud gives the following account. "Bill Trader had a job performing maintenance on vending machines for Pepsi Cola and dropped by my house with a song that he needed written down. He called before he came by to see if I was busy. He said, 'I've got a song in my head and I'm afraid I'll lose it'. Bill couldn't read music and was a 3 chord guitar picker. He had a melody and would sing it while I played the guitar and wrote it down. He paid me $5.00 for writing a lead sheet for him". Bud is the one who came up with the chord progression for the song and says that a guy named Howard Simpson ran a recording studio where Bud played guitar on the first cut of the song. Apparently Simpson played a big part in the promotion of the song. He also told me he still has a few songs that he wrote down for Bill Trader that he was never paid for and were never picked up. Bud is an interesting fellow. He taught himself to play the guitar, later the mandolin, the bass and the banjo. He worked at Griffin Music in Charlotte and pretty much taught himself to read and write music. He has authored 6 mandolin books and co-authored two guitar books with Bill Bay of Mel Bay music. He lives in the same house where he was born, in an old section of Charlotte, has never married and supports himself in his retirement by teaching music and receiving the royalties from his publications." Bill Hopkins of Blythewood, South Carolina, knew the Trader family, Bill and his daughter Shirley, all of whom disappeared abruptly one day! When I was twelve years old, I lived in Hartsville, South Carolina, and my parents worked in a cotton mill; one of the two largest employers for the town. We lived on the Mill Village adjacent to the mill where almost all of the other Village residents also worked. In 1952, I was in the sixth grade at Thornwell Public School, about six blocks away from my home. I was also in love with a beautiful classmate, Shirley Trader. For a very shy twelve year-old, being "in love" meant that I alone knew that was what was wrong with me, and I tried hard to keep the secret of my constant blushing from my classmates. Shirley had seemingly appeared out of nowhere and joined our class in mid-term; something unusual because our population was rather stable and new classmates were rare. Rare and very strikingly beautiful, in this case; being taller than the other girls and very slim, with long, unruly hair made her even more interesting to me. After all, I was tall and slim also, so she was a natural attraction. On the second or third day, I discovered that she walked home after school along the same general route I took, although she did not take the usual shortcuts. The next day, I followed her closely enough to see where she lived, and it was on the other side of the square Mill Village; five streets west and five streets south. The next day, I made certain to leave when she did and offered to show her a shortcut through the edge of the campus of the girls' college. We talked and made efforts to overcome our shyness. The walking home routine continued for weeks. We were commuting friends! My family never had visitors who were not family, so the presence of a stranger was an event of major curiosity. The first Sunday afternoon when Mr. Trader came to visit my Dad was an historic event for me because of its uniqueness. He brought his guitar and he and Dad sat on the front porch, playing and singing. Dad had done that alone on many occasions, and I loved hearing him play his guitar and sing in his smooth, soft voice. He and Mr. Trader sang and played songs I had heard on the radio, and songs I had never heard. They repeated those sessions on occasion and I sat on my bed with the window open, listening to the two troubadours on the porch just ten feet away. Dad worked in the Mill, was self-taught on the guitar, and had played with The Palmetto Playboys on weekends in dance clubs and anywhere else that would pay the gas money to get there. All worked in the cotton mill, and the Playboys earned as much making music on Saturday night as they made from a week's work in the mill. Dad (Malcolm), his brother, Harvey, along with Harrison Hutchinson, Angish Hawkins, and my mother's half brother, Boyd Hammonds loved making music together. My Mom would listen to the latest songs on the only radio station in town and write the lyrics down for them to have the latest tunes on weekends. 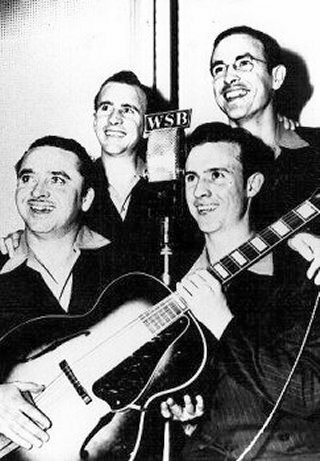 The Palmetto Playboys had been given a weekly radio show on AM radio station WOLS, in Florence, SC, in 1935, and it lasted until mid-1938. That may or may not have had anything to do with Dad knowing Mr. Trader, but I was too young to be interested in the adult conversations. They played well together, and Dad's voice imprinted the sound and spirit of Woody Guthrie and early American Country music in my background memories of growing up. I walked Shirley home after school for a few months; as far as her front porch. Duty done, I retraced the blocks home. I don't remember Shirley's mom, and I'm not sure one was around, but I always thought Shirley could have used a mother's touch. I do remember that Mr. Trader did not work in the Mill, and that made their "living on the Village" very unusual. We children were surrounded by poor children because we were all poor. Wearing the same clothes for days in a row and having unkempt hair was commonplace and we paid no attention to others' dress. In any case, Shirley remained a breathtaking beauty to me and lives as that in my memory even now. One morning, Shirley got to school late and was very excited. She had never been disruptive or ever did anything that would call attention to herself, but she was effervescing with excitement. "Daddy sold his song and Hank Snow is going to sing it! Daddy said we are going to be rich!" I knew who Hank Snow was. I knew Mr. Trader could write songs. I didn't know anyone who was rich. The next day, Shirley had a written excuse and left school at lunch time. The following morning, Shirley caused a stir because her hair had been cut and she was dressed nicely and was suddenly even more attractive and exotic than ever to my twelve year-old self. She suddenly looked like one of the college girls I saw on the nearby campus! That afternoon before class ended, Mr. Trader came to our classroom and Mrs. Tindall, our teacher, introduced him as Shirley's father. Shirley joined him at the front of the classroom and Mr. Bill Trader played his guitar and sang his to-become-popular song while facing Shirley as she stood facing him. "A Fool Such as I" was the song I had heard him and Dad sing on our porch! I had heard it several times, but I didn't know how special it was. It had been just another song to me. Shirley left with her father as the school day ended. That was on a Friday. I remember that because Shirley was not in class on Monday, and Mrs.Tindall told us that afternoon that Shirley had moved away and would not be in our class any longer. After school, I walked to her house and found it empty. 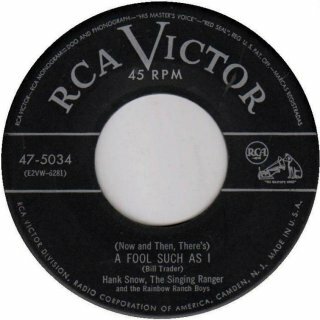 Not many weeks after that, I heard Hank Snow singing A Fool Such As I on our hometown WHSC radio. Over and over it was played. Every time I heard it, I wished I could have told Shirley goodbye. I never heard of them again, but I hope she got very rich. Who really wrote "Blowin' In The Wind"? My (Dylan-related) review of Stephen King's "Song of Susannah"